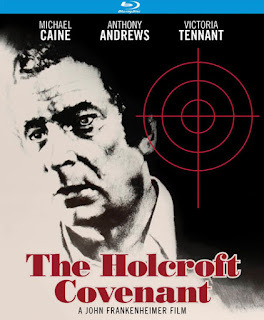 Kino-Lorber has released John Frankenheimer’s “The Holcroft Covenant” (1985) in new Blu-ray and DVD editions, superseding a previous DVD release on the MGM label in 1999. Frankenheimer fans will be pleased to see this relatively obscure title available in remastered Hi-Def. Privately, even they may have to admit that it’s deservedly obscure because it’s a clunker, marking a sad decline from the excellence of “The Manchurian Candidate” two decades before. With that 1962 masterpiece, Frankenheimer and scenarist George Axelrod benefited from superlative source material, Richard Condon’s razor-sharp Cold War political thriller. “The Holcroft Covenant” was adapted from lesser stuff, a bestselling but stumble-footed 1972 suspense novel by Robert Ludlum. Multiple screenwriters are credited: George Axelrod, Edward Anhalt, and John Hawkins. The problems with the movie suggest a combination of Ludlum’s lame storytelling to begin with, additional troubles in trying to turn the rambling, 528-page potboiler into a leaner, 100-minute-long movie, and questionable choices by Frankenheimer himself. Noel Holcroft, a German-born New York architect, learns that he is the main trustee of a covenant drawn up 40 years before, in the last hours of the Third Reich, by three officers of the Nazi High Command. One of the officers, General Clausen, was Holcroft’s father. Once it’s signed by Holcroft and the children of the other two officers, the covenant will release $4.5 billion from a secret Swiss account, a fortune accrued over four decades from Nazi funds diverted by the three officers during the war. Clausen’s posthumous directive specifies that the trustees are to spend the fund for beneficent purposes, to atone for Hitler’s atrocities. Holcroft must locate the other trustees -- the son and daughter of General Tiebolt and the son of General Kessler -- so that the covenant can be activated. His mother Athene (Lilli Palmer), who had fled Clausen and Germany early in the war, cautions Holcroft to walk away from the arrangement because his father couldn’t be trusted and neither can the directive: “He was a Nazi through and through.” But Holcroft idealistically proceeds anyway, joining in Berlin with the Tiebolt brother and sister, who have taken the name Tennyson, and the Kessler son, a symphony conductor now calling himself Maas. Mysterious characters enter the story in Zurich, New York, London, Berlin, and finally Zurich again, seemingly intent on derailing the covenant, as bodies begin to pile up around Holcroft. Did I mention that Holcroft is played by Michael Caine, because, well, if you need an actor to play a German-born New Yorker, you want Michael Caine? As Frankenheimer notes in a director’s commentary track repeated from the 1999 DVD, the “New York” scenes in the film were actually shot in London, so why not simply transfer the phony U.S. setting to the U.K., ignore the character’s New York upbringing from the novel, and make him a German-born Londoner to match Caine’s accent? Reportedly, Caine was a last-minute replacement for James Caan, who walked off the movie, so Frankenheimer may not have had time even for minor script adjustments. A good trouper, Caine honestly appears to invest a lot of energy in the part, accent aside. But it hardly matters because Holcroft is a dolt who does anything he’s asked to do without a second thought, no matter how inconvenient, nonsensical, or dangerous. Drop everything and fly to Zurich at the behest of a total stranger who claims to be a representative from an international bank? Wouldn’t you? Hop over to London at the request of another total stranger and agree to meet yet a third stranger in Trafalgar Square at 5 p.m. tomorrow? (“And don’t look for him. He’ll find you.”) Sure, why not. Rendezvous at a church with a mysterious woman in a bad disguise, and then hide out with her in a sleazy Berlin brothel to avoid the bad guys? I’m on it. Read more at Cinema Retro. I watched this in the 1990s simply because it was an adaptation of a Robert Ludlum novel. I remember it being something of a clunker, too.